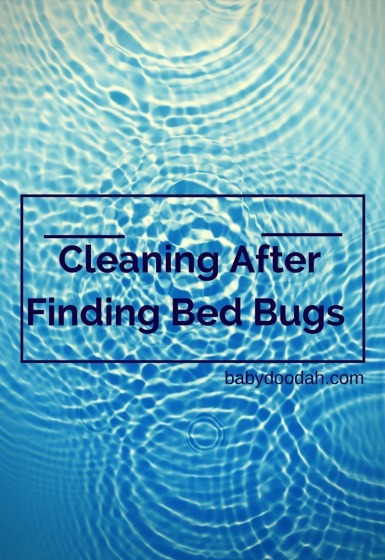 Cleaning After Finding Bed Bugs - Baby Doodah! Finding bed bugs in your home can be a nightmare situation, I’m sharing my tips on how we got the majority of them out of the house before we had pest control come in. If you haven’t read my post about identifying bed bugs, I recommend you click and read it. You’ll understand more of how we found them, it will give you the full picture. Finding bed bugs in your home can be a nightmare situation, especially if you are not armed with the appropriate means to handle the situation. While, I truly hope you never have to deal with them, I’m going to be sharing our exact process for how we cleaned up, immediately after finding them. The first thing we did was collect all of the bedding that had been infested. We wanted to remove the bedding without having the bed bugs fall out and land elsewhere in the house. Since we did not have everything we needed from the very beginning, we did the best we could. I grabbed all of our white 13 gallon trash bags and brought them to the entrance of Emmett’s room. Then I slowly started peeling away his sheet and mattress pad, I curled them inside of themselves and immediately placed it into a white garbage bag, tied it tightly closed and took it to the basement. When washing items that may have bed bugs or their eggs on it, you want to ensure that you are washing your clothes in hot HOT water and then drying (for at least 30 minutes) in the highest temperature your dryer can go to. This will kill off any of the living bugs and their eggs. I also recommend, that even if you don’t see any bugs on an item, you wash &/or dry it anyway, there could be eggs that you’re not seeing and you don’t want to mess around. We took all of the stuffed animals, blankets, everything on Emmett’s bed and our own, down and washed them. Once I had the first load of wash running, I went back upstairs to see how Emmett was doing. I recommend having a full queue of TV shows/books/new toys for your little one to play with, or better yet, if you can send them to a friend or family member’s house, do that. We didn’t have that luxury, so Emmett got to watch an extreme amount of TV that day. Back in Emmett’s room, we took the entire crib apart because we wanted to ensure that there were not any bed bugs hiding inside of the brackets of the crib. While Seamus was doing that, I went through his dresser, ensuring that there were not any bugs hanging out inside or underneath any of the drawers (there weren’t, thank goodness). We also took the time to check the drawers of his nightstand and changing table, and the only place we found them (in his room) was on his bed skirt and around the baseboards near his bed. Anything that was left in his room was placed inside of a white plastic garbage bag and immediately taken into the basement. We wanted to avoid any risk of the bed bugs spreading elsewhere in our apartment. In my next post, I will be sharing how we managed to keep the clean laundry from getting re-infested and how we started the pest control process on our own. If you want to read more about how we identified the bed bugs in our home, feel free to click on through. If you’ve had bed bugs, or other pests in your home – what were your first steps in fighting them, before you could get the professionals in? Comment below!